Pakistan's cricket-star-turned politician Imran Khan declared victory on Thursday for his party in the country's general elections. 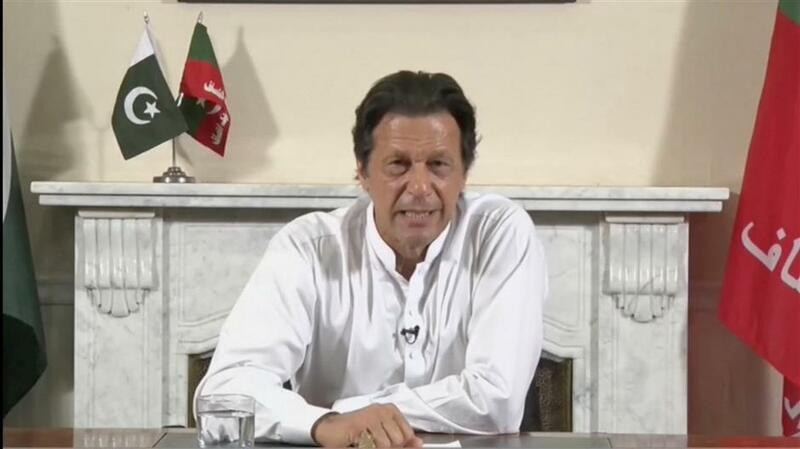 Cricket star-turned-politician Imran Khan, chairman of Pakistan Tehreek-e-Insaf (PTI), gives a speech as he declares victory in the general election in Islamabad, Pakistan, in this still image from a July 26, 2018 handout video by PTI. Pakistan’s cricket-star-turned politician Imran Khan declared victory on Thursday for his party in the country’s general elections, promising a “new” Pakistan following a vote that was marred by allegations of fraud and militant violence. Pakistan’s election commission has not yet released final results, but Khan has maintained a commanding lead according to projections by many television stations, although it’s unclear if his Tehreek-e-Insaf party, or PTI, would get a simple majority or have to form a coalition government. Khan’s message of a “new” Pakistan resonated with young voters in a country where 64 percent of its 200 million people are below the age of 30. More than a dozen TV channels in Pakistan, based on official but partial counts, were projecting — using their own, undisclosed methodologies — that Khan’s party is getting as many as 119 seats of the 270 National Assembly seats that were contested. The remainder in the 342-seat Lower House of Parliament includes reserved seats for women and minorities. But before even half the votes were counted, Khan’s leading rival Shahbaz Sharif, who heads the Pakistan Muslim League — the party of jailed ex-prime minister Nawaz Sharif — rejected the vote, generating fears that disgruntled losers could delay the formation of the next government. TV projections give his party hardly 61 seats. The election, in which Pakistanis voted for the National Assembly and the four provincial assemblies, marked only the second time in Pakistan’s 71-year history that one civilian government has handed power to another.